Photojournalism Student Tim Tai is an award winning journalist from the University of Missouri (http://tinyurl.com/qefnrgx). Tai has an incredible future in the field of journalism based on his current portfolio. Unfortunately, Tai also recently learned a hard lesson about his chosen field at the hands of his fellow students and some employees of the University of Missouri. Tai has covered a broad range of stories, which is amazing considering his young age. One only needs to look at his body of work to understand that Tai has a great deal of passion and integrity for the vocation he is pursuing. Tai is the type of person who is needed in journalism. The fact was made abundantly clear based on how Tai handled himself during an ill-fated encounter. Tai learned first-hand about the ugly nature of ochlocracy while trying to cover several breaking stories at the University of Missouri related to the racial tensions at the school. 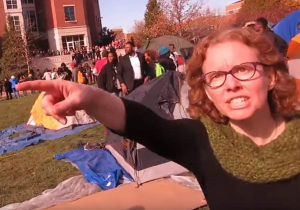 For the initial coverage of the events at the University of Missouri, I defer to the reporting by Matt Pearce – Los Angeles Times – http://tinyurl.com/ng7szr2. There are many disturbing elements of this story – mob rule, infringement of 1st Amendment rights, threats of violence that can be viewed as racist, but the most alarming issue is the response by communications professor at the University of Missouri Melissa Click and university’s Assistant Director of Greek Life Janna Basler. Both ‘professors’ can be seen attempting to use physical intimidations against the media, including Tai. Click can be heard actually trying to incite students to physical assault members of the media, once again including Tai (“Who wants to help me get this reporter out of here? I need some muscle over here!”). The irony of this confrontation is clearly lost on both these professors – both professors are white and Tai is Asian-American. Further still, many of the students are white or African-American, and their actions could be seen as racist as well (based on the lens of the world in which they promote). One professor (Click) assignment is to help promote a ‘1st Amendment’ atmosphere on the campus. In their effort to expose the truth and fight against racism, they tried to shut down the press and assaulted an Asian-American. Making matters worse are two other facts. The first is that Click posted on her Facebook page encourages the press to come to the campus to report on the story. The second is that the University of Missouri is one of our nation’s leading journalism schools. It would actually be laughable if not for the fact that the actions by some of the UOM faculty, and the students, weren’t so tragic. What is alarming is the growing trend on college campuses to attempt to stifle free speech. For two college professors to use intimidation and threats of physical force should concern all of us, and in a world with common-sense, should have resulted in the firing of both Click and Basler. Additionally, the overreaction by Click and Basler, along with the students, is frightening because it demonstrates how disconnected many are from reality, and the inappropriate force that follows.